So goes one of my favorite poems from one of my favorite poets of all-time, e.e.cummings. Spring, to me, is about cherry blossoms in full bloom, birds and bees and butterflies fluttering from one flower to another, the sky at its bluest, and nature at its happiest. Which is why, as we usher in springtime, I chose to share with my dear readers some colorful jewelry pieces that capture the very essence of spring. Do note that this is a self-sponsored giveaway, and the items listed above were personally selected (and bought) by me. This giveaway is open internationally, so everyone's encouraged to join - even if you're halfway across the globe. Ready for your chance to win? Send in your entries through the Rafflecopter below. This giveaway is part of A Tisket A Tasket Spring Giveaway Hop by ShePromotes.com! This event will take place from April 8th at 12:01am EST through April 22nd at 11:59pm EST. 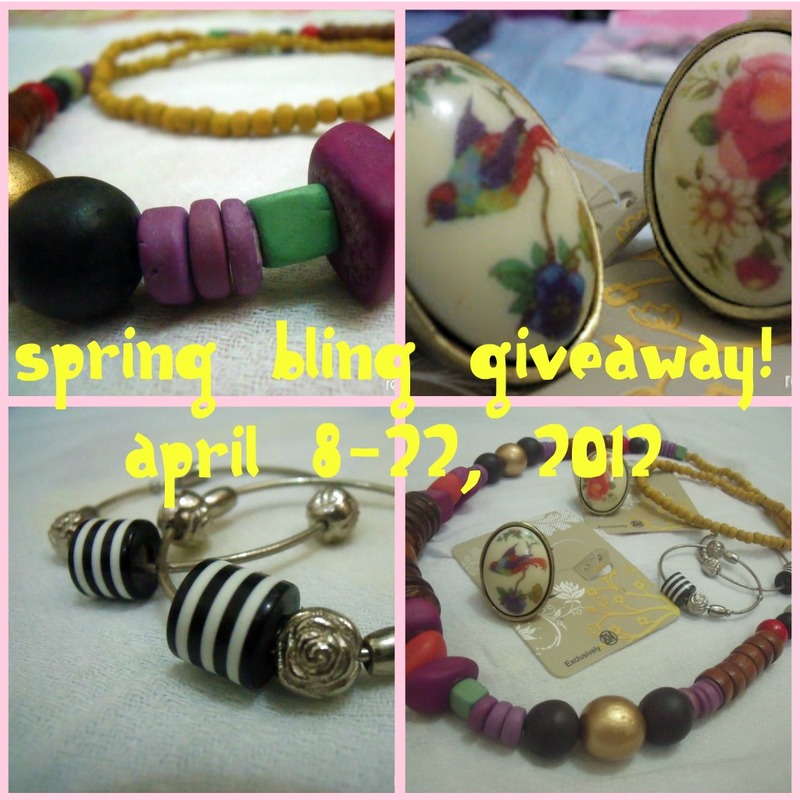 Over 100 bloggers have wonderful prizes valued at a minimum of $25 to help brighten your spring! After you're done with this giveaway, please take time to visit all the other blogs participating below. Good luck! My idea of spring is a fresh garden! Beautiful jewelry! What an awesome giveaway to have! Thanks for sharing! My idea of spring is the scent of hyacinths. My idea of spring is the tulips starting to pop up and bloom, the cherry tree blossoms and coloring eggs for Easter! Spring is when the world fills up with the wonderful smell of flowers! What a great giveaway! These are fun spring items. Someone is going to be very lucky. Spring for me is colorful dresses, beautiful flowers and digging into cleaning my house. spring is when you can open the windows and let the breeze blow through the house, freshening the air and the home. The nice weather and the flowers and grass growing. Predictable weather so that I can plant my garden! i love the warm weather that comes with spring and gardening! When talk about spring, the fisrt thing in my mind is FLOWERS... lots of Flower and perfect weather! Spring is the transition time between winter and summer. Spring refer to the ideas of rebirth, renewal and regrowth. spring for me is like flowers in full bloom.. new life, new venture. Spring is like the color that add your life. Lots of colorful flowers. birds singing, buds sprouting, happy times warm weather and friends! Spring brings the wind of changes!!! My idea of spring is new beginnings. Spring is changing of the season.